When using GO for Continuous Delivery with multiple teams where you have various security groups, you usually end up with multiple template types. Depending on your application ecosystem you might have different deployment methods depending on the application type, that have some overlapping. At the moment we don't have the ability to have Stage templates, so you need a completely new template when you have differences. 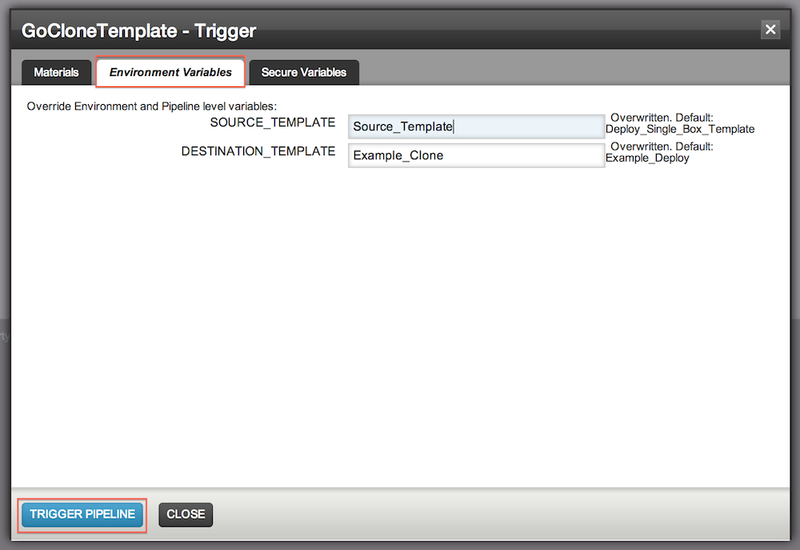 We have decided to have one deployment template separate per application / security group (Pipeline group) so we distribute maintenance, but also reduce the risk of breaking Pipelines of other teams when we change a base template. Having different templates also allows us to allocate Template Admins specific for the application / team / security group that now can manage most of the needs of a team without requiring GoCD System Admin rights. As you don't want team to get Admin access across multiple applications but you still want them to have something to start with (a base template), we have created two Basic templates that cover basic needs for an application deployment that we "Clone" for each team. After cloning we assign an Admin from their team so they can start modifying it according to their own flavour. 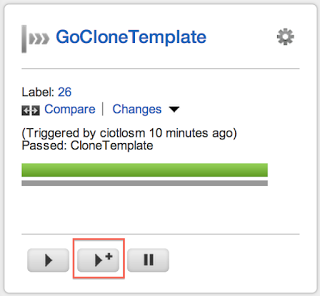 Cloning templates is not available in GO at the moment, so we had to find a way around it. One contributor created a script that interacts with GO's own Configuration API to allow template cloning. Use the "Trigger with options" button to do the magic! Create a new template group for your "Administrative" tasks that you give permissions only to the persons you want to use the cloning. This will be useful if you decide to have more "configuration" type of pipelines. In our organisation we have a "tooling" repository we use to wrap complex scripts to use in our tasks. I will not go into detail on how to achieve this, but you can read more on how to specify permissions for pipeline groups. You will need to create new pipeline within this group. You will need to use Git as Material Type and under the URL, use the location of the cloning script (https://github.com/oanastoia/go-config-management.git if you have access to it, or the location where you cloned it). Use "Check Connection" to test it out. After adding the code, please add the API_USER and API_PASS Secure Environment Variables to reflect the correct user and password as seen in the above screenshot. 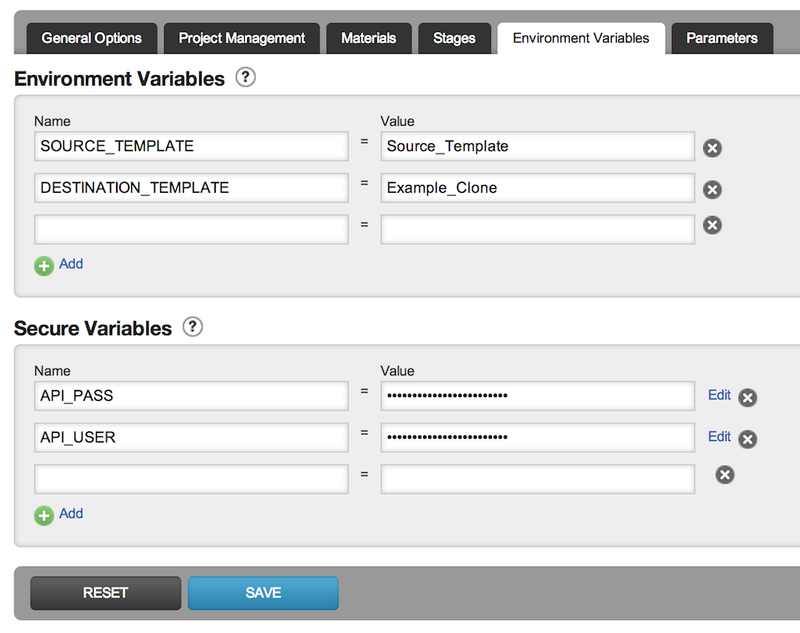 Now you can just trigger your pipeline with options and go to the Environment Variables tab to put in the right details for cloning.